Today, September 15, 2010 marks the 189th anniversary of the formal independence of Central American nations from Spain. Today in Tegucigalpa, as an alternative to a state-sponsored parade comprised of members of the military and certain private schools, the Honduras Accompaniment Project of the Friendship Office of the Americas observed thousands of Honduran citizens participating in a peaceful march organized by the National Front of Popular Resistance (FNRP) demanding a National Constituent Assembly and the refundación (re-foundation) of Honduras. The FNRP considers this call for the constituyente equivalent to a call for a “second” independence—independence from those who currently hold economic and political power in the country. The marchers left the eastern end of Morazán Boulevard shortly after 9am and arrived at the central plaza downtown roughly two hours later, where a rally continued for some time. The crowds were made up of many groups who had banners, t-shirts, or flags to identify themselves: campesino organizations, high school and university student groups and marching bands, teachers’ organizations, various labour unions, the LGBTI community, women’s and feminist organizations, artists’ collectives, neighbourhood associations, youth groups, representatives of political organizations; as well as numerous individuals and families who actively participated yet did not visibly claim membership to a particular organization. 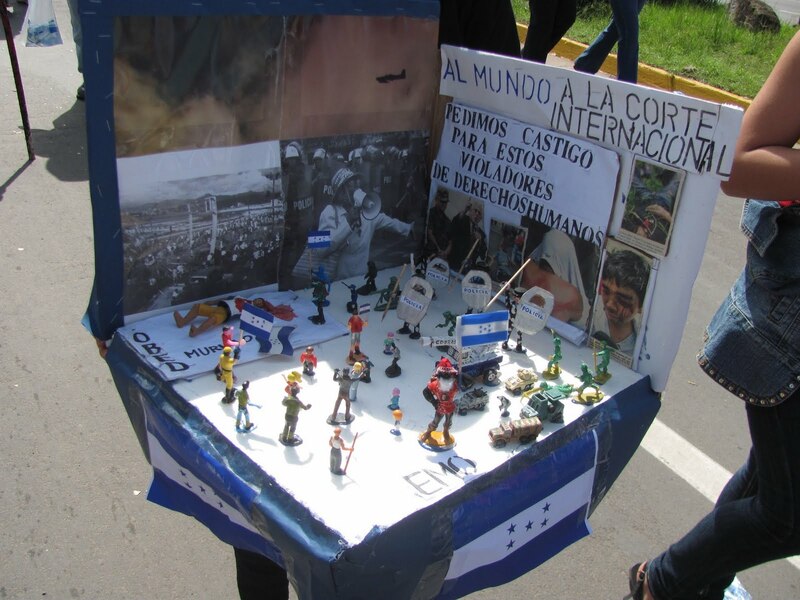 In addition to the marching bands, there were dancers, marchers in paper maché masks and colourful costumes, and children and adults carrying dioramas and other artistic representations of the Honduran political situation. Until midnight tonight, the signed sovereign declarations by Hondurans of voting age are being collected in a well-known union hall in Tegucigalpa, with a press conference planned tomorrow to release the final numbers. The FNRP already proclaimed earlier this week that they had surpassed their goal of 1.25 million signatures. The current Lobo regime claims that 1 million Hondurans voted in last November’s elections, which were held under Roberto Micheletti’s de facto regime, installed after the coup on June 28, 2009. Bodies such as the Organization for American States (OAS) and the Carter Centre, however, decided not to sanction the 2009 elections with official observers due to the conditions under which they occurred, and the voter participation figures are highly contested. 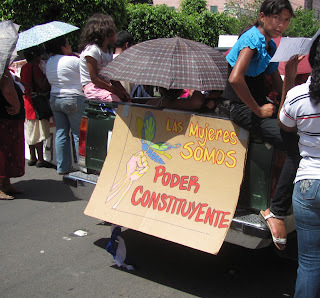 FNRP representatives at the march in Tegucigalpa said their collection of sovereign declarations, including individuals’ names, signatures, thumbprints and ID numbers, is proof that more Hondurans support the Constituent Assembly than supported last year’s elections. Parallel events were also held in Siguatepeque and San Pedro Sula, as well as other areas of the country. In San Pedro Sula, there was violent repression by the police. 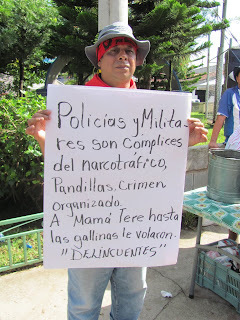 One elderly individual who was selling lottery tickets in the park is reported to have died as a result of tear-gas poisoning, and at a public forum on of the FNRP “Independence and Resistance” this evening at the COPEMH hall (a national union of high school teachers) it was reported that 31 people are currently detained in San Pedro Sula, and a child was in delicate condition as a result of tear gas poisoning. We were told that police stormed a concert that was taking place in the central plaza of the city after the marchers gathered there, throwing tear gas canisters onto the stage and into the crowd, breaking the musicians instruments and damaging the rented sound equipment. 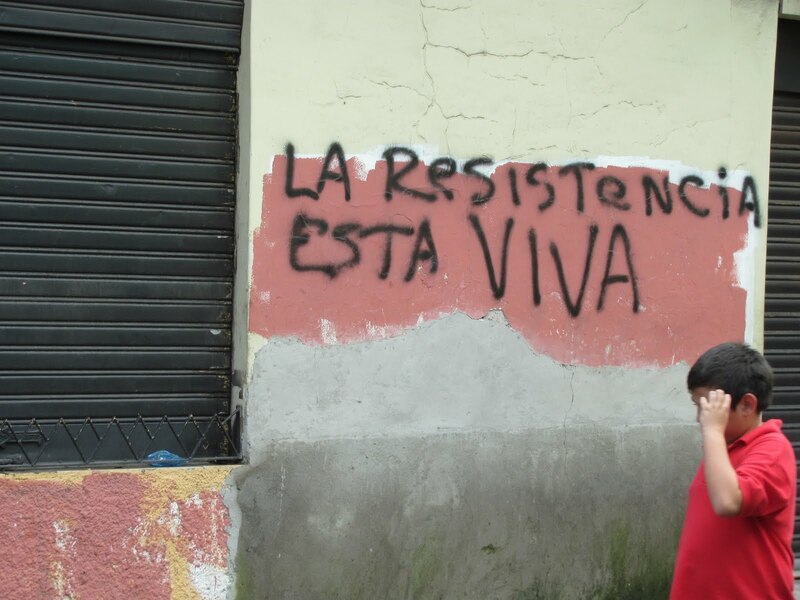 The Honduras Accompaniment Project will stay in close contact with staff of the Committee of Relatives of the Detained-Disappeared in Honduras (COFADEH) as they pursue the case of human rights violations at the San Pedro Sula Independence Day events over the coming weeks. 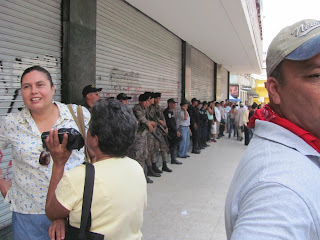 The march and rally in Tegucigalpa took place without any such incidents reported at the time. Police and military blocked off all exit all exit and entry points to the main boulevard where the march was taking place, and police lined the streets on the blocks leading to the central plaza, but we observed no overt repression and no violent acts by marchers. When marchers found the main road between Boulevard Morazán and the central plaza blocked off by police riot troops, following some verbal statements by some protestors to the police, the crowd continued on, singing and chanting, via an alternate route. The rally included speeches by leaders of the FNRP and updates on the events in San Pedro Sula and other areas of the country. At least three blue and white helicopters were observed circling over marchers as they made their way along Morazán Boulevard, and during the rally at least four fighter jets flew over the central plaza low enough to overpower sound systems and making maneuvers in the air. Some march participants expressed concern to observers that though there was no overt repression during today’s events in Tegucigalpa, they expected to hear reports of continued targeted attacks against human rights defenders and active FNRP members in the days to come.